Each year in December, Frenchmen Rico Leroy travels half way around the world from his home in France to Hawaii. The fortunate son, handles his business from long distance but at the same time, seems to be the Happiest Frenchman in the world. 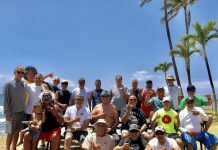 Leroy comes to Surf, Stand Up Paddle, Tandem Surf and race in some of the OC-1 Canoe races, sometimes makes the trek twice a year if he is participating in the Molokai Hoe in October. Best job in the world connecting the pas-sion of this water enthusiast with his work. He owns a company called “WOO” Waina Outrigger Organization, and head of the Communication. “Growing up in the North of France, about an hour from Paris, there isn’t any surf, so he later moved to Lacanau Ocean, where he can enjoy the ocean everyday. “ I love it where I live, as people are very welcoming and good people” Leroy, lives with his girlfriend Elodie and their two children Vatea (14) and Leimokuolaikekaio’Hilo (4 ½). 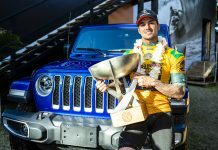 He and his tandem partner Sarah Burel, recently competed in the World Tandem Championships at Makaha, placed third with some of the best competition in the World, and placed second in the Canoe Surfing Division, a four man canoe competition that included Burel. 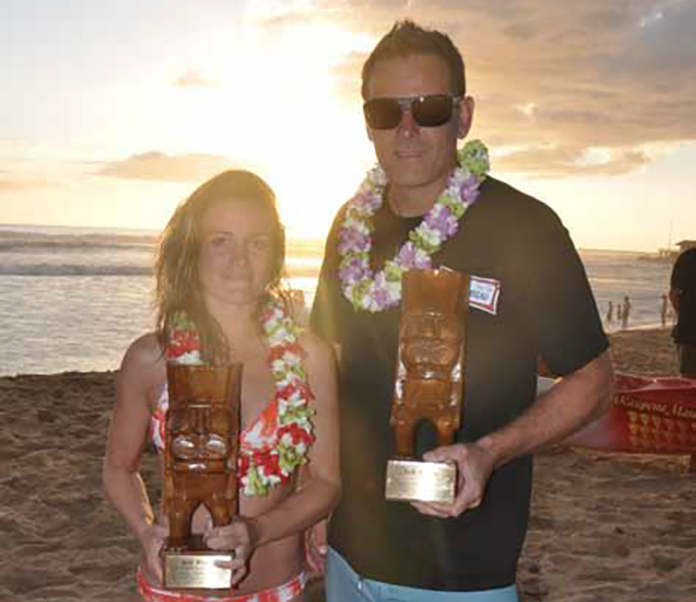 Other accolades include Leroy being awarded the French Waterman of the Year award in 2010 and the Aloha Award at the Dukes Oceanfest in 2006. Surfing large waves when he comes to the North Shore, Leroy commented “We tried (to tandem) Pipeline once, we surfed Sunset a few times at 15 to 20 foot, and we (also) surfed Waimea and charged few bombs all over the world”. My favorite spots include his home break of Lacanau, “it’s always the best spot but de-spite that we love Hawaii, but in Hawaii it is Gas Chambers; in Bali, Uluwatu; Australia, Lennox; Tahiti, Haapiti; Marocco, Dahkla; Mundaka, Spain. He has surfed the globe, and for starting in 2000, just fifteen years, he has mastered and surfed more places than some veteran surfers. His surf adventures have brought him to Australia, New Zea-land, Morocco, California, Spain, Portugal, Ireland, Florida, Tahiti and Indonesia. Leroy is the example of “living the life of a waterman”, water in the day, work when you can, and support your ohana at the same time. He said “ its all about the “stoke”. Whether its Tandem surfing, “Sharing is caring” or on his canoe or stand up. He trains for tandem competition, “by surfing as much as possible when conditions are good” If not, we use the Cross-fit method He sometimes uses the gym to workout,” I’ve been at the gym very much when i was a pole vaulter, so i have try to find some-thing more fun and the crossfit came out”. Rico also suggest for someone getting into tandem surfing, “ The more time you spend together the better you become”. The laid back Leroy when on land be-comes a fierce competitor when placed in water, has been competing since 2006 , date of the 1st Tandem World Championship event held by the ITSA, “we have compete more than 50 contests”. Leroy would, “love to see Tandem surf-ing competition on very good waves like the World Surfing League dream tour does. Makaha was a blast for us and we are work-ing to keep the Tandem at the right spots for the future”. The Leroy/Woo team would like to thank his sponsors NSP and Picture Organic Clothing, “I am so grateful for them. I am also an ambassador for Julbo Eyewear, NO-TOX and Quikblade.